No, not really dying. I am ecstatic! 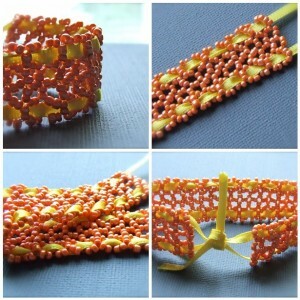 I came up with these Lattice Ribbon Bracelets a while ago. I adored them, still do, but I was very unsure of how they would be received by people. You see, these bracelets do not have clasps. What? Yes. You simply tie the ends of the ribbons together. Now, bracelets in general I think require some assistance to put on and take off. Yes I know of “bracelet buddies” and other little contraptions that are supposed to help, but it’s likely you will have to ask someone to assist you. Even with toggle clasps, the easiest of clasps to maneuvre, in my opinion. SO, I just wasn’t sure if people would take to the whole tying thing. So, I recently sold one of these Lattice Ribbon Bracelets to a lovely gal by the name of Amy, who informed me that she would be wearing it on the day of her wedding as an accent in her favourite colour. Love it! I was thrilled to hear that. I mean I think all jewelry designers love to be a part of peoples weddings. It’s a very special thing. But, I was also thrilled to know that people were not put off by “no clasp bracelets”. So I sent it off to Amy, wished her well and thanked her very much. Then today… she sent me this. Is Amy not the most beautiful bride ever? She completely made my day with this. I am so thrilled to have been able to be a part of her special day. AND I am so happy to know that she was pleased with her purchase from me. Thank you very, very much Amy! Congratulations to you and your new hubby!